"Custer's Last Stand" during the Battle of Little Bighorn in 1876. The Sioux Wars were a series of conflicts between the United States and various subgroups of the Sioux people that occurred in the later half of the 19th century. 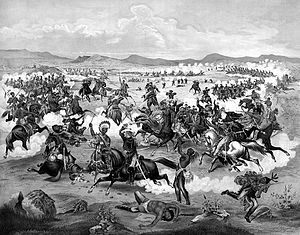 The earliest conflict came in 1854 when a fight broke out at Fort Laramie in Wyoming, when Sioux warriors killed several American soldiers in the Grattan Massacre, and the final came in 1890 during the Ghost Dance War. The First Sioux War was fought between 1854 and 1856 following the Grattan Massacre. The Santee Sioux or Dakotas of Western Minnesota rebelled on August 17, 1862 after the Agency traders wouldn't distribute them their food supplies, they were accounted for. After pillaging part of the nearby village of New Ulm and attacks on Fort Ridgely, from which the whites suffered severe losses, and the victorious Battle of Birch Coulee on September 2, the Indians were eventually defeated on September 23 in the Battle of Wood Lake. Most of the warriors who took part in the fighting escaped to the west and north into Dakota Territory to continue the conflict, while the remaining Santees surrendered on September 26 at Camp Release to the US Army. In the following war-trials 303 Indians were sentenced to death of which, after closer investigation from Washington, eventually 38 were hung on December 26 in the Town of Mankato in America's largest mass-execution. In the aftermath, battles continued between Minnesota regiments and combined Lakota and Dakota forces through 1864 as Col. Henry Sibley's troops pursued the Sioux. Sibley's army defeated the Lakota and Dakota in three major battles in 1863: the Battle of Dead Buffalo Lake on July 26, 1863; the Battle of Stony Lake on July 28, 1863; and the Battle of Whitestone Hill on September 3, 1863. The Sioux retreated further, but faced a United States army again in 1864. General Alfred Sully led a force from near Fort Pierre, South Dakota, and decisively defeated the Sioux at the Battle of Killdeer Mountain on July 28, 1864. The Colorado War began in 1863 and was primarily fought between American militia while the United States Army played a minor role. Several native American tribes attacked American settlements in the Eastern Plains, including the Lakota Sioux who raided in northeast Colorado. On November 29, 1864 Colorado Volunteers under the command of Colonel John Chivington attacked a peaceful Cheyenne and Arapaho village camped on Sand Creek in southeastern Colorado. Under orders to take no prisoners the militia killed an estimated 150 men, women, and children, mutilating the dead and taking scalps and other grisly trophies of battle. The Indians at Sand Creek had been assured by the U.S. Government that they would be safe in the territory they were occupying, but anti-Indian sentiments by white settlers were running high. Later congressional investigations resulted in short-lived U.S. public outcry against the slaughter of the Native Americans. Following the massacre the survivors joined the camps of the Northern Cheyenne on the Smokey Hill and Republican rivers. There the war pipe was smoked and passed from camp to camp among the Sioux, Cheyenne and Arapaho camped in the area and an attack on the stage station and fort, Camp Rankin at that time, at Julesburg on the South Platte River was planned and carried out in January, 1865. This successful attack, the Battle of Julesburg, led by the Sioux, who were most familiar with the territory, was carried out by about a thousand warriors and was followed up by numerous raids along the South Platte both east and west of Julesburg and a second raid on Julesburg in early February. Following the first raid on January 7, 500 troops under the command of General Robert B. Mitchell consisting of the Seventh Iowa Cavalry, the First Nebraska Veteran Volunteer Cavalry, and Companies "B" and "C," First Nebraska Militia (mounted) had been removed from the Platte and were engaged in a fruitless search for hostile Indians on the plains south of the Platte. They found the camp on the Republican River occupied by the tribes only after they had left. A great deal of loot was captured and many whites killed. The bulk of the natives then moved north into Nebraska on their way to the Black Hills and the Powder River but paused to burn the telegraph station on Lodgepole Creek then attacked the station at Mud Springs on the Jules cutoff. There were 9 soldiers stationed there, the telegraph operator and a few other civilians. The Indians began the attack by running the stock off from the station's corral along with a herd of cattle. Alerted by telegraph, the Army dispatched men from Fort Mitchell and Fort Laramie on February 4, about 150 men in all. Arriving on February 5 the first party of reinforcements of 36 men found themselves facing superior forces, estimated to number 500 warriors and with two men wounded were forced to retreat into the station. The second party of 120 troops under the command of Colonel William Collins, commandant of Fort Laramie, arrived on the 6th and found themselves facing 500 to 1000 warriors. Armed with Spencer repeating rifles the soldiers were able to hold their own and a standoff resulted. After about 4 hours of fighting the war party left and moved their village to the head of Brown's Creek on the north side of the North Platte. Collins' forces were soon reinforced by 50 more men from Fort Laramie who had towed a mountain howitzer with them. With a force of about 185 men Collins followed the trail of the Indians to their abandoned camp at Rock Creek Spring, then followed their plain trail to the south bank of the North Platte at Rush Creek where they encountered a force of approximately 2,000 warriors on the north side of the river. An inconclusive fight followed and the decision was made to abandon pursuit of the war party. In his report Colonel Collins correctly predicted that the party was en route to the Power River Country and would continue to raid along the North Platte. His estimate of Indian casualties during the two engagements was 100 to 150, many more than reported by George Bent a participant in the war party. In 1865 Major General Grenville M. Dodge ordered a punitive expedition against the Sioux, Cheyenne and Arapaho tribes that lived in the Black Hills region. General Patrick E. Connor was placed in command with hundreds of regular and volunteer soldiers at his disposal. Connor divided his force into three columns, the first was under Colonel Nelson Cole and was assigned to operate along the Loup River of Nebraska. The second column, under Lt Col Samuel Walker, would travel north from Fort Laramie to occupy and area west of the Black Hills while the third, led by General Connor and Colonel James H. Kidd, would march up the Powder River. Only minor skirmishing occurred until August 29, 1865 when Connor's column of about 400 men encountered about 500 Arapahos of Chief Black Bear in the Battle of the Tongue River. That morning Connor's men charged and captured a village and routed the defenders who counterattacked unsuccessfully. A few days later a small party of soldiers and civilian surveyors was attacked by the Arapaho in what became known as the Sawyers Fight, three Americans were killed and it marked the last skirmish of the Powder River War. The Great Sioux War refers to series of conflicts from 1876 to 1877 involving the Lakota Sioux and Northern Cheyenne tribes. Following the influx of gold miners to the Black Hills of South Dakota, war broke out when the native followers of Chiefs Sitting Bull and Crazy Horse left their reservations, apparently to go on the war path and defend the sacred Black Hills. In the first major fight of the war, on March 17, 1876, about 300 men under Colonel Joseph J. Reynolds attacked approximately 225 Northern Cheyenne warriors in the Battle of Powder River which ended with a United States victory. During the fighting, the Cheyenne were forced to retreat with their families further up the Powder River, leaving behind large quantities of weapons and ammunition. Next came the major Battle of Rosebud on June 17 when 1,500 Cheyenne warriors, led by Crazy Horse himself, defeated a force of 1,300 Americans under General George Crook. Crook retreated which helped lead to the infamous Battle of Little Big Horn beginning on June 25. Lieutenant Colonel George Custer, commanding a force of over 600 troops, was badly defeated with the loss of over 300 men killed or wounded, including himself. The next major engagement occurred at Slim Buttes on September 9 and 10. While moving toward Deadwood to secure supplies for Crook's command, elements of the 1st Cavalry commander by Capt Anson Mills located and attacked a Sioux village. The Dull Knife Fight, on November 25, and the Battle of Wolf Mountain on January 8, 1877 were the last major fights in the conflict. During the latter, Nelson A. Miles defended a ridge from a series of failed attacks led by Crazy Horse, and shortly thereafter he surrendered at Camp Robinson, thus ending the war. That autumn, the Sioux were moved to a large reservation in the Dakota Territory, but the government pressured them to sign a treaty giving up much of their land. Sitting Bull had returned from Canada and held the Sioux resistance together for a few years. But in the summer of 1889, the reservation agent, James McLaughlin, was able to secure the Sioux’s signatures by keeping the final treaty council a secret from Sitting Bull. The treaty broke up their 35,000 acres (142 km²) into six small reservations. On the Sioux reservations, McLaughlin had Kicking Bear arrested, while Sitting Bull’s arrest on December 15, 1890, resulted in a struggle between reservation police and Ghost Dancers in which Sitting Bull was killed. Two weeks later, the military intercepted Big Foot’s band of Ghost Dancers. They were Minneconjou Sioux, mostly women who had lost husbands and other male relatives in the wars with the U.S. military. When Colonel Forsyth tried to disarm the last Minneconjou of his rifle, a shot broke out, and the surrounding soldiers opened fire. Hotchkiss guns shredded the camp on Wounded Knee Creek, killing, according to one estimate, 300 of 350 men, women, and children. ↑ Chapter 32, Ware, Eugene, The Indian War of 1864: Being a Fragment of the Early History of Kansas, Nebraska, Colorado and Wyoming", Crane & Company (1911) Eugene Ware was the most junior officer in the Seventh Iowa Cavalry when on September 19, 1863 it was deployed to Omaha in route to the Indian Wars.